The legendary timepiece, featured in every Waldorf Astoria lobby, is an homage to the New York original built for the World’s Fair in 1893, but these have a distinct difference. Each one reflects the unique fabric of its location, specifically created by a local designer using local materials. This one is based on the ancient astrolabe, used to determine the five exact prayer times in the Islamic faith. It’s an extraordinary piece; the clock’s faces decorated with turquoise glass accents and engraved with a famous phrase from a traditional Bedouin poem. 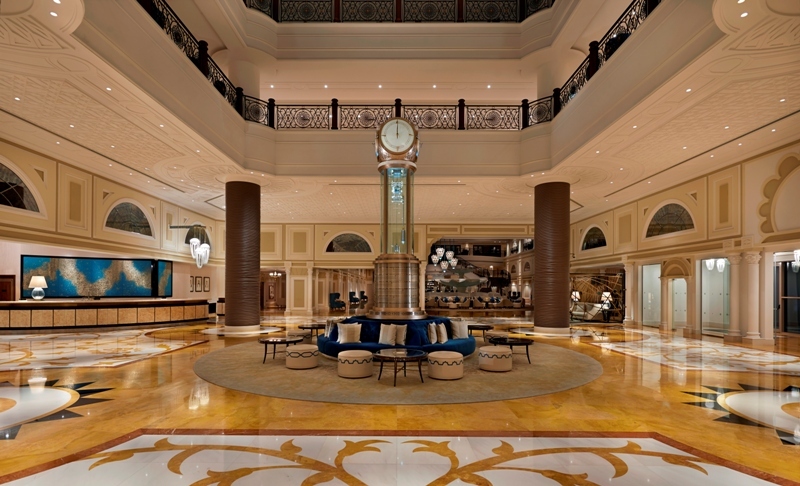 The clock reflects everything about this magnificent hotel, which quite simply oozes class and elegance from every one of its pores. Of course, you might say that everything in the UAE glitters gold, but here in Ras Al Kaimah things are a little different to its more illustrious neighbours less than hour’s drive away. This northernmost Emirate is like a breath of fresh air. Very little traffic, majestic mountains, mangrove forests, soaring sand dunes and miles of white sandy beaches. 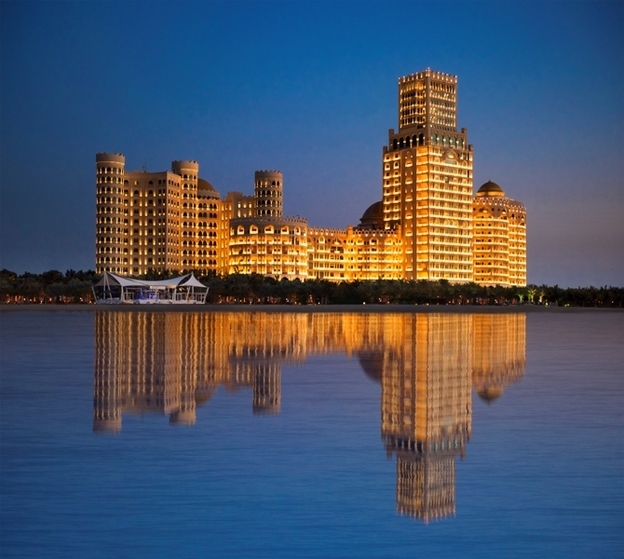 It’s an Emirate in development and the Waldorf Astoria was one of the first luxury hotels to take full advantage of its potential. High up in my 15th floor junior suite I’m still trying to get my breath back. It’s the view. 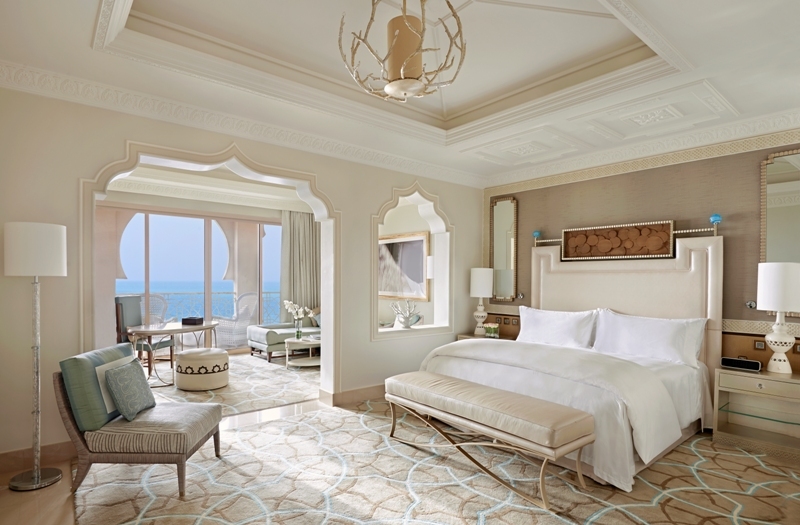 Floor to ceiling glass looks out at pools and manicured gardens far below, and beyond that, miles of white beach and the turquoise of the Persian Gulf. Mind you, the view up here is pretty spectacular too. This is an opulent living space. A study in beige. A king bed with a headboard inlaid with mother of pearl. An Arabian-style arch leads out to an alcove with a marble top work desk and a chaise area. A bounty of fruit and dates wait on a nearby table. A discreet door leads to the wrap around balcony and a set of plush outdoor furniture. Back inside there’s a separate spacious dressing room that magically lights up as I pass by. A black marble bathroom has a shower room and separate tub, twin sinks and a bevy of Salvatore Ferragamo Tuscan toiletries. The phone rings just as the door bell rings. A brief moment of panic. What to do first? The call is from guest services asking me if the room is acceptable. Meanwhile the door opens to a waiter bearing more plated delights for me. In an instant, both are gone and tranquillity returns to my luxury hideaway. 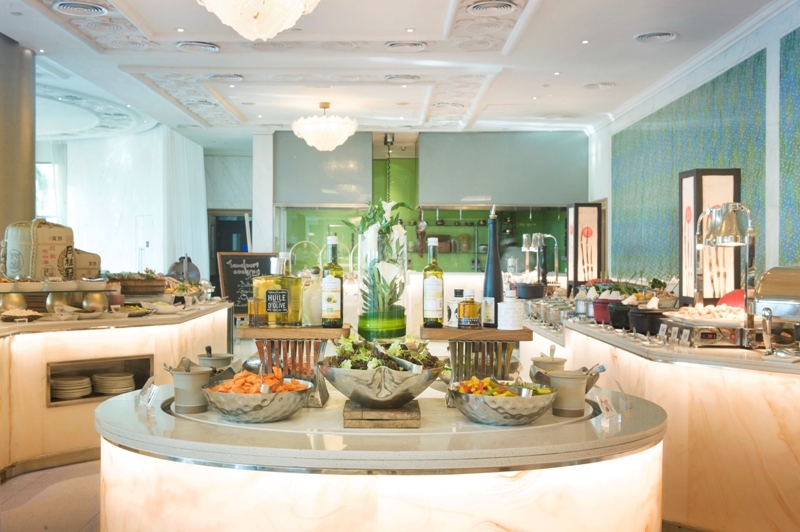 Breakfast is calling and downstairs the Qasr al Bahar buffet is in full swing. The outdoor terrace or an inside table are the least of my problems. This is a buffet fit for royalty. Freshly baked breads and pastries. Exotic fruits. Middle and Far Eastern favourites hold hands with classic Western dishes. Eggs in every style. And plenty of fresh healthy options. Later tonight I have date with Marjan, the Waldorf Astoria’s top floor Middle Eastern restaurant with menus created by legendary Lebanese chef Joe Barza. For now though, I take a stroll through the manicured gardens and pools towards the beach. I’m tempted for a moment to just lie by the adult-only pool, but the sound of the surf wins me over and I fall into the grateful embrace of a soft sun bed. After dark the Waldorf Astoria takes on a new perspective. The regal facade lit up with a million lights is a beacon of welcome from miles away. Fire lamps light the way through the gardens. Top of the range cars arrive dispensing VIPs to important dinner dates. And the restaurants take on a veneer of discreet ambience; cosy corners to evoke conversation. Up on the top floor Marjan’s food is as majestic as the twinkling landscape below. 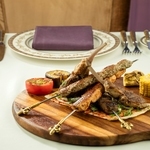 My set Yakoot menu (AED 400) of hot and cold mezzeh, mixed grill and date cake with fresh fruit a mouth watering sampling of middle eastern cuisine. My own table top barbecue and beetroot hummus are two personal highlights for me. 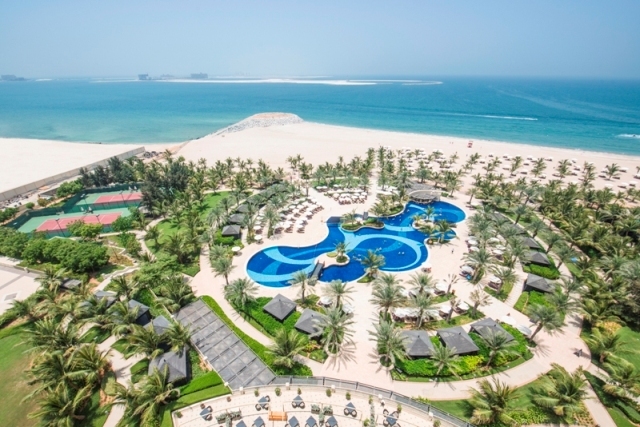 RAK is fast developing as a genuine alternative to Dubai and Abu Dhabi and with the Waldorf Astoria they have a touch of class to make it happen.